I try to soak my cashews overnight but in a pinch you could soak them for about 30 minutes and they will be fine. 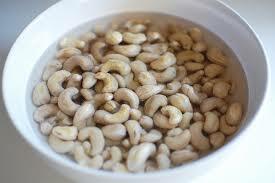 Drain and rinse cashews well and place all the ingredients in a high powered blender or food processor. Blend until desired consistency. Try adding fresh herbs to create flavorful color pallets. Bring water to a simmer in a 3- to 4-quart heavy saucepan. Add grits in a slow stream, whisking until incorporated. Simmer, stirring occasionally with a long-handled whisk or wooden spoon, until liquid is absorbed and polenta is thick and soft, about 30 minutes. (Grits will have a loose, risotto-like consistency.) Remove from heat and stir in cream, cheese, salt, and pepper. Keep warm, covered. If using porcini, halve if large, then slice lengthwise into 1/4-inch-thick slices. If using oysters, trim spongy base if necessary and slice caps into 1/2-inch-wide strips. 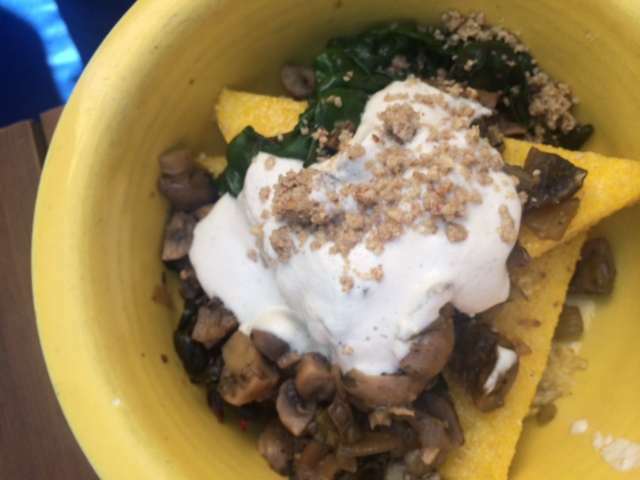 If using chanterelles, leave small mushrooms whole, halve if medium, and quarter if large. If using lobsters, cut into 1/2-inch pieces. If using hedgehogs, trim base of stems and halve caps if large. Heat oil in a 10-inch heavy skillet over moderately high heat until hot but not smoking, then sauté mushrooms, garlic, salt, and pepper, stirring occasionally, until mushrooms are golden and any liquid they give off is evaporated, 6 to 8 minutes. Add water, butter, lemon juice, and parsley. Heat, swirling skillet, until butter melts and liquid forms a sauce. Top each serving of polenta with mushrooms and mascarpone. Serve immediately (polenta stiffens as it cools), sprinkled with Parmigiano Reggiano.